This abundant still life includes a pewter dish with two oysters, a half-peeled lemon, bread, a pomegranate, grapes, a watch with key ribbon, a Wan-li porcelain bowl containing an orange and a lemon, a gilt cup, a silver wine jar, a glass of white wine and pewter dish and cut ham on a plaited straw basket. 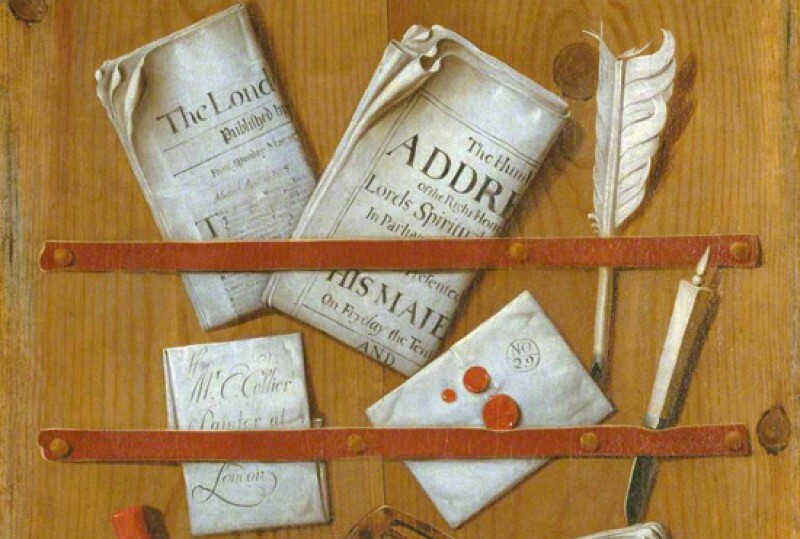 These objects can be found in different combinations in the artist's work from 1655 onwards. A similar still life in a private collection, dated 1657, may be contemporary. The silver wine jar reflecting the artist at work wearing a hat is seen in a number of still lifes, including a particularly sumptuous example in The Mauritshuis in The Hague. It has been noted that the pitcher appears in all these works in exactly the same position, suggesting that the artist did not own this expensive vessel but relied upon a drawing as a model for each of these works. Unlike a normal reflection which reverses the image, van Beyeren's image on the jar shows an artist painting with his right hand, ie. a reflection of a left-handed artist. It may be that van Beyeren was left-handed but it may also be that he improvised his reflection without troubling to reverse the image.